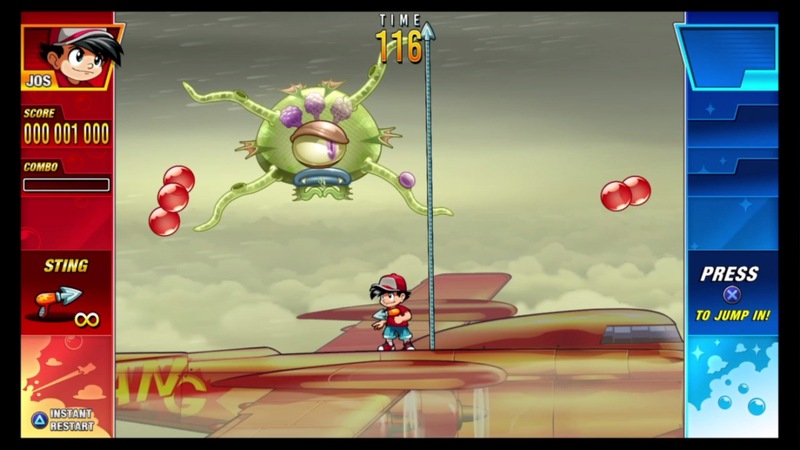 The world has been invaded by aliens and it’s up to you as a scrappy young Pang brother to save the day. This might sound like the intro to a great sci-fi story if it wasn’t for the aliens weapon of choice… Bouncy balls! Dotemu’s HD remake of a classic arcade game Pang Adventures or as it was called in North America “Buster Bros.” is everything you want in an arcade game. Its simple to learn, difficult to master game play as a 2d shooter is paired with a bright and cartoony graphic style. The characters though simple are bold, flashy, and colourful. The backgrounds did their part and reminded me of days spent in the arcade throwing quarters into machines. The sound effects work well with the games theme and more than enough to add to the arcade feel. The aliens have a wide variety of balls at their disposal each with their own unique movement and abilities. There are red balls which obey the laws of gravity, blue balls which do not, then there are lightning balls, cloud balls, metal balls, shielded balls, bomb balls, and even lava balls. There is a strategy to dealing with each of these to make sure you don’t get bonked on the head or worse, all of which result in your death. As a Pang brother where would you be without an awesome arsenal of weapons yourself. To get you started you’re given a grappling hook, not only the does the hook portion pop the balls but also the chain. This can be upgraded for faster shot speed and the ability to pop two balls at once. There is also a shotgun, flamethrower, laser blaster, ninja stars, and many more. Although some of the weapons are powerful all but the hook-shot have limited uses and must be used carefully so as not to waste ammo. Level design starts out easy enough but soon your faced with complex puzzle levels or frantic button mashing. 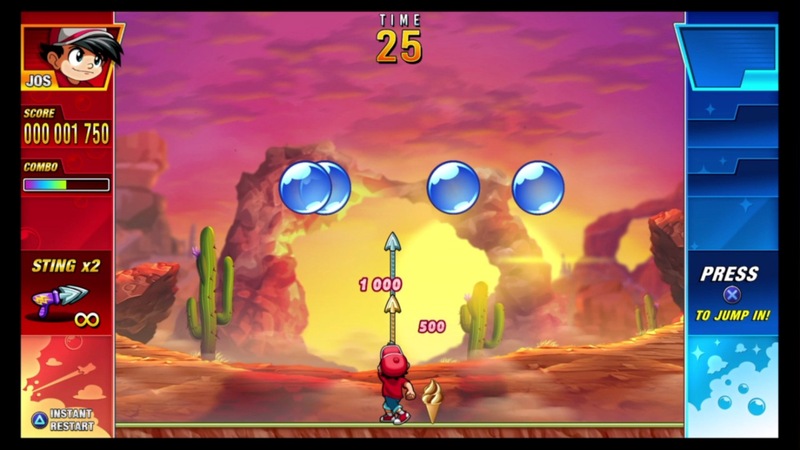 To successfully clear a level all you must do is clear the enemy balls, however there are 2 other goals that you can work towards which are achieving a high score and never missing with your weapon. There are multiple worlds each modelled off different parts of earth which are really just backdrops but still breaks up the monotony. Between each of these worlds is a boss battle versus an alien ship which get progressively more difficult. The game has couch co-op multiplayer adding to that arcade feel and you’re even able to revive your brother in arms if he falls victim to being hit in the head by a ball. 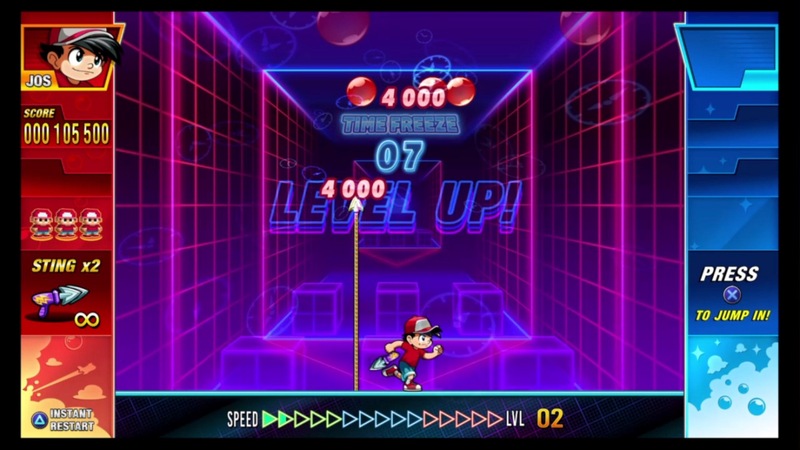 There are 3 modes of play; Tour mode which is basically story mode, Score attack mode which is the same story only with 3 lives for a more classic feel, and finally unlimited mode which is an endless progression of faster and more complicated patterns balls. 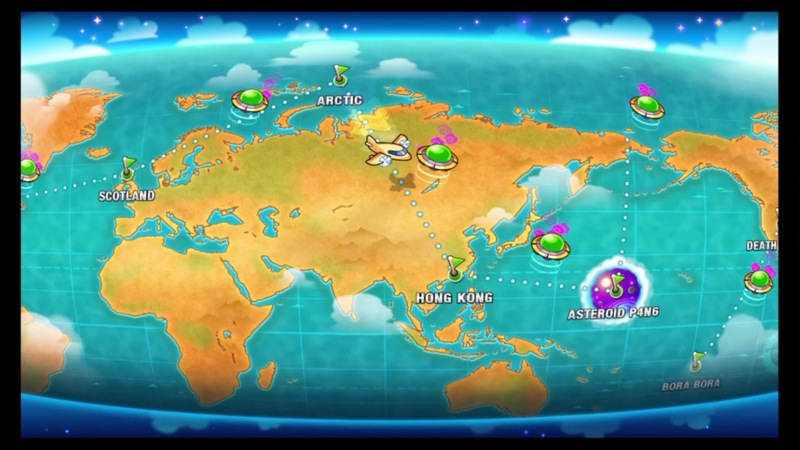 In story mode you can use the world map to go to earlier levels to re-attempt the challenges, this of course adds to replay value. All in all Pang brothers was a fun little arcade game. The simple gameplay and charming graphics brought me back to my youth and the budget price tag is great if you want a few hours of enjoyment for under $10. It just goes to show that it doesn’t take amazing graphics or a huge immersive story to elicit a bit of fun. February 12, 2017 in Josh Pang, PC, PS4, Review, Xbox One. Howdy! I simply wish to give a huge thumbs up for the nice info you have here on this post. I shall be coming back to your blog for more soon.